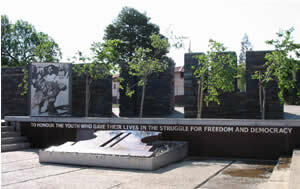 Hector Pieterson, age 13, was one the first students to be killed during the 1976 Student Uprising in Soweto. He has since become a symbol of youth resistance to apartheid. 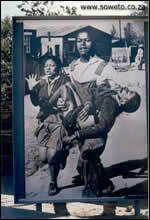 This uprising started on 16 June as a peaceful protest march organized by school students in Soweto. One of the main grievances was the introduction of Afrikaans, regarded as the language of the oppressor, as a medium of instruction in all African schools. Many young people were inspired by the ideas of Steve Biko and the Black Consciousness Movement, giving them the necessary impetus to resist the Bantu Education system, introduced by the apartheid government in the 1950s. This system, dubbed ‘gutter education’, was designed to train African people to accept a subservient role in apartheid society. Hundreds of students joined the protest march planned by the South African Student Movement (SASM), to the Orlando Stadium East where they intended to meet with the authorities to voice their grievances. They carried placards with slogans – ‘Away with Afrikaans’, ‘Amandla Awehtu’ (Power to the People), ‘Free Azania’ (Free South Africa) and sang ‘Nkosi Sikelel’ iAfrika’ (God bless Africa), now the national anthem of South Africa. In Orlando West, police confronted the marchers and ordered them to disperse. Despite the peaceful nature of the march, the confrontation turned violent and was here that a number of students, including Hector Pieterson, were shot and killed. What was a student march, quickly erupted into an uprising, which spread to many other parts of the country. The photograph by Sam Nzima of a young man, Mbuyiswa, carrying the critically injured Hector Pieterson in his arms, captured the attention of people throughout the world and highlighted the injustices of apartheid. After the 1976 Uprising a heightened political awareness saw the emergence of new leaders such as Cyril Ramaphosa, Murphy Morobe, Popo Molefe, Tsietsi Mashinini, Seth Mazibuko and Khotso Seatlholo. Local civic organizations strengthened and scores of young men and women crossed the country’s borders to join the military wings of the African National Congress (ANC) and the Pan Africanist Congress (PAC). Many were imprisoned on Robben Island (off the coast near Cape Town) where the younger generation learned much from the older ANC and PAC comrades already there and as a result Robben Island became known as the ‘Robben Island University’. The 1976 Student Uprising changed the course of South African history and accelerated demands such as those for the release of political prisoners, the unbanning of political organizations and the formation of a new democratic South Africa. After the first democratic election in 1994, 16 June was declared ‘Youth Day’ to commemorate the contribution made by South Africa’s youth to the struggle against apartheid. 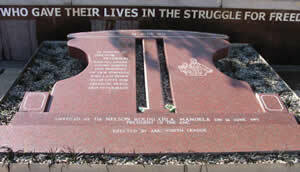 A memorial to hector Pieterson was erected in the early 1990s and is situated in Khumalo Street, a few hundred meters from where he was shot. A new museum opened in 2002 and houses photographic and audio-visual displays of the struggle of the youth against the injustices of apartheid.